Shakespeare’s writing is so embedded in our cultural fabric that when media technologies change and evolve, new ways of relating to the Bard are sure to follow closely behind. So say the organizers of a path-breaking conference taking place at the University of Guelph this November. “Outerspeares: Transcultural / Transmedia Adaptations of Shakespeare” is the first Annual Conference of the Guelph Early Modern Society, a collaboration between students and faculty in the School of English and Theatre Studies at the University of Guelph. Arguing that our globalized, digitized media environment has truly become, in Shakespearean terms, a “brave new world,” the conference aims to show how new media are changing the way we understand Shakespeare and, in the process, are transforming our understandings of history, culture, and media itself. 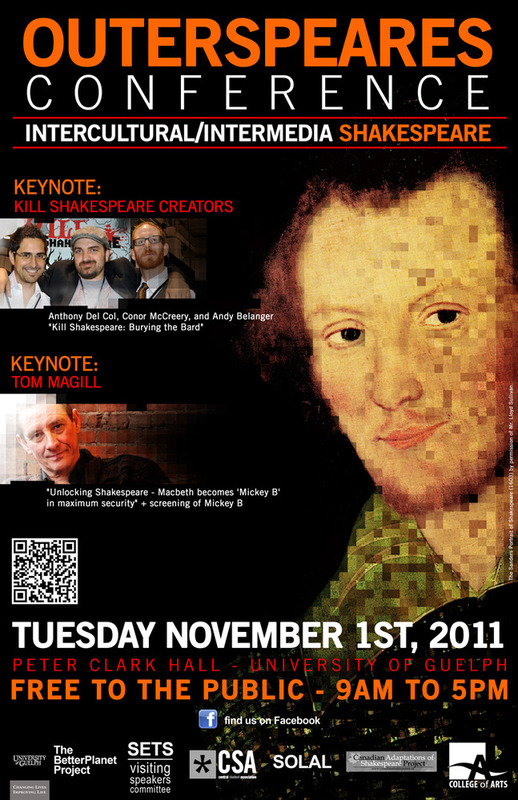 The keynote speakers for the conference include Anthony Del Col, Connor McCreery, and graphic novel artist Andy Belanger, co-creators of the Kill Shakespeare graphic novel series, which is soon to be adapted into a major motion picture, and Tom Magill, director of “Mickey B,” an adaptation of Macbeth whose cast is made up of prison inmates from Northern Ireland’s notorious Maghaberry Prison. Magill’s work as both a dramaturge who has worked extensively with Augusto Boal and as a prisoners’ rights advocate and arts educator can be viewed in the short clip below. The clip addresses the question “Can prisoners become positive role models for youth at risk?” and was filmed at a public debate on this question held at Newtownabbey just outside of Belfast (a debate marking the launch of the educational pack associated with Mickey B in 2011). Second Chance For Change Year One: Making of The Films from Educational Shakespeare Co on Vimeo. Other talks consider diverse topics such as Shakespeare on Facebook, Shakespeare in film after 9/11, YouTube culture, Iranian adaptations, and much more. The Outerspeares Conference is being produced in collaboration with the School of English and Theatre Studies, the SETS Visiting Speaker’s Committee, the Guelph Central Student Association, the School of Languages and Literatures, the College of Arts, and the Canadian Adaptations of Shakespeare Project (CASP) directed by Dr. Daniel Fischlin. The conference is free to the public and to the university community at large, and will take place at Peter Clark Hall in the University Centre on November 1 from 9:00 AM to 5:30 PM. Contact the Guelph Early Modern Society for more details. For a review of the conference published in The Ontarion click here. For the CFRU FM review of the conference (“Outerspeares Conference Shakes Up Early Modern Studies”) click here.